458 SOCOM NEW STARLINE | DiamondKBrass.com | 500 Ct.
All Starline headstamp yellow brass finish. Starline's manufacturing process involves, consistent metallurgy, precise tooling, tight quality control and 40 years of industry experience. Their brass is guaranteed to have flash hole presence and to be of the correct length and diameter. Unlike some competitors, Starline’s brass is vertically drawn, effectively minimizing wall thickness variation. In addition, they anneal their cases between each draw to ensure consistent metallurgy in all lots. Simply put, they are unwavering in their commitment to quality. .458 SOCOM (.458) 350gr RS 100 ct. These guys are the best. My order was shipped promptly and arrived in perfect shape. The price is right and since the Brass is 222 Rem it is getting a little hard to find and if you do it is expensive. Darned 223 Caliber. I love the 222 and these guys were able to help me at a good price. I will come back for more. Received 500+ 45 Auto R.P. Pistol brass.Very pleased with product & shipping.This is my 7th order with this company. This is the place! I have been purchasing brass from these fine folks for years and have never been disappointed. The shipments are very quick, there is always extra brass, a large selection is always available, and the product is provided exactly as advertised at a very good price. What more could you ask for? I just sent for some more brass and will no doubt be delighted when it arrives. I have ordered multiple times from Diamond K and I've never been disappointed. I placed an order on Sunday and I received my brass on Wednesday morning in Nebraska. I cannot swear that all the casing are fired only one time because some of the primer pockets are fairly dirty, but I always clean my primer pockets before I re-cap the brass. I plan on obtaining my brass from Diamond K as long as I continue to reload. The price is very reasonable. 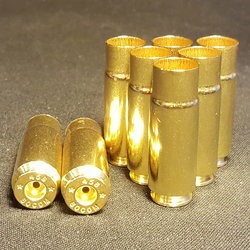 Ordered 1000 pcs of 45acp brass and am very pleased will do business with Diamond K again received my order 3 business days after it was placed and brass looks good. Received my order. today.Supper fast shipping brass looks great price is fair will purchase again.